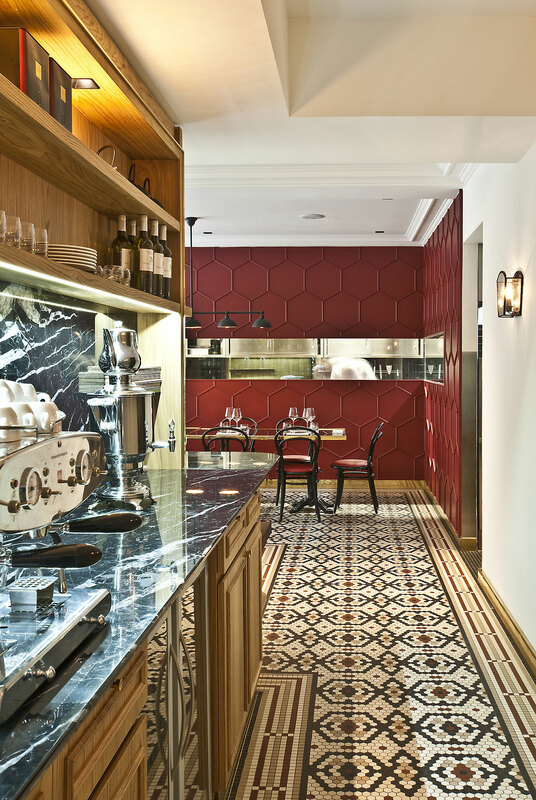 Injecting a certain ‘joie de vivre’ into Milan’s bustling district of Porta Nuova since late 2015, Le Vrai Brasserie and Boulangerie, designed by Parisian architect and interior designer Karine Lewkowicz, has brought an authentic slice of French atmosphere and flavour to the Italian city. 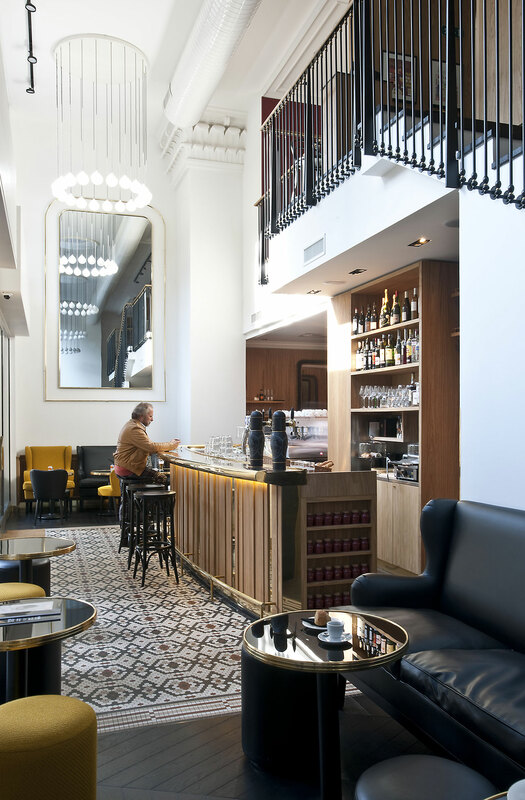 The 320-square-metre former bank space has been transformed into a warm and welcoming venue consisting of a bakery and a bar restaurant servicing the Milanese with traditional French flavours, aromas and sophisticated flair. 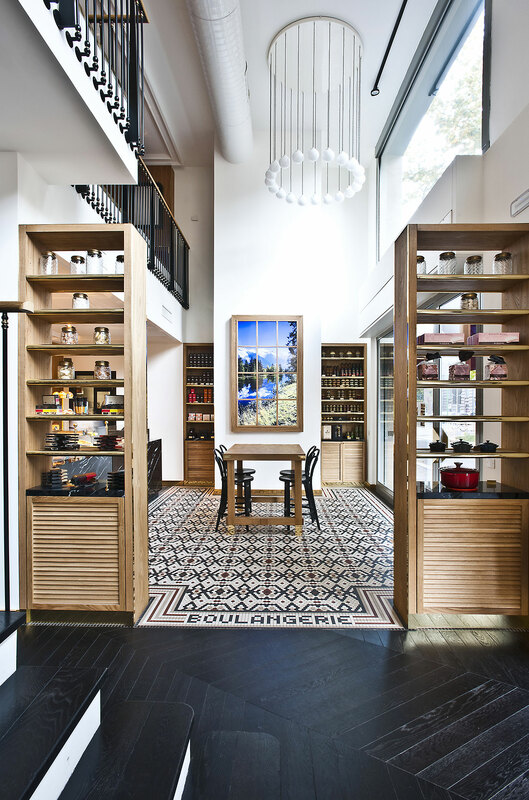 With a carefully considered melange of traditional detailing and modern sensibility, Lewkowicz has realised a sophisticated, transportive space. 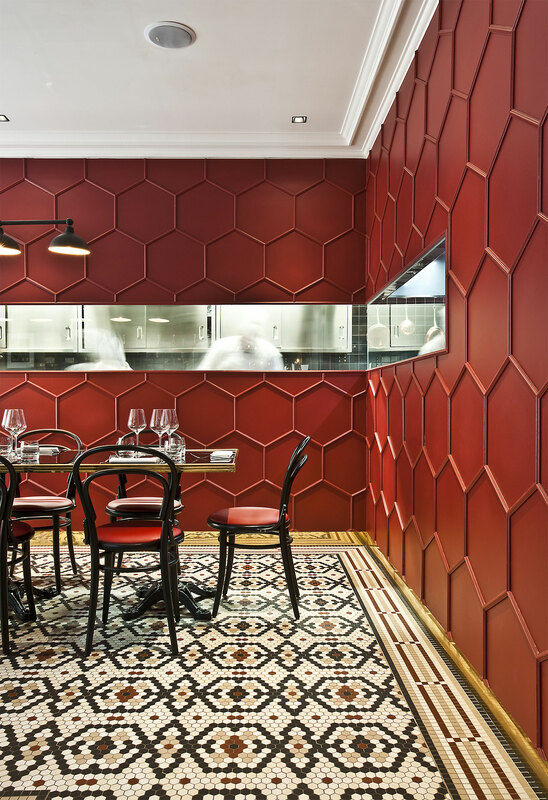 The traditional tessellated floor pattern becomes a key motif informing the overall design language as it is carried through from the wall pattern to details such as the door handle —ultimately informing Le Vrai’s logo and signage, which sits proudly in the window, framed in luminous neon. 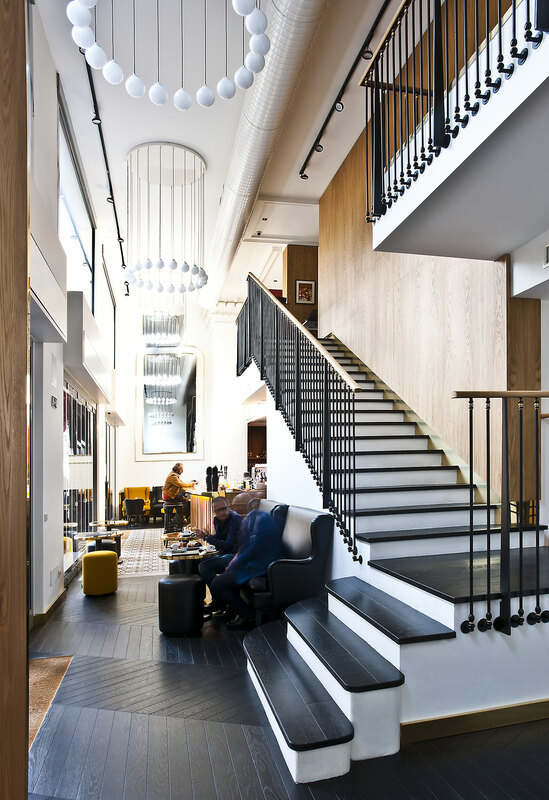 A warm timber and polished brass-detailed bar is a focal point on entry leading into a light-filled lounge furnished in rich dark leather armchairs and settees, and accented with French mustard coloured ottomans. 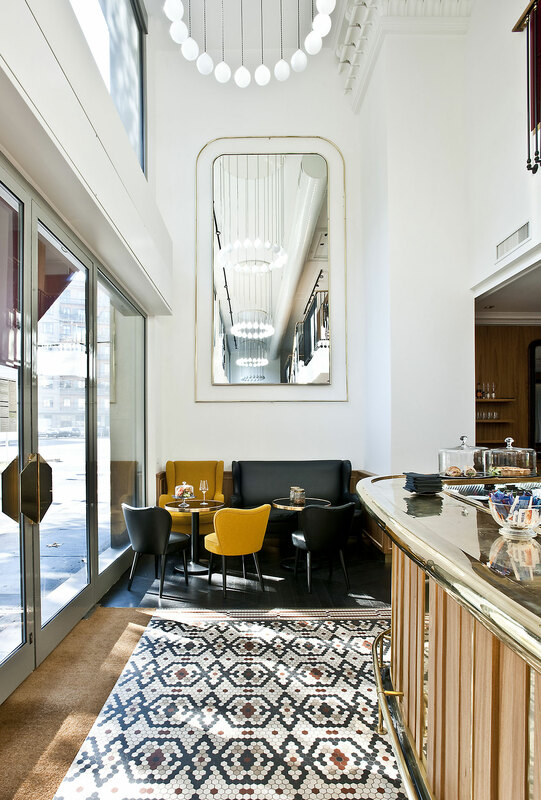 A large scale mirror overhead highlights the fabulous ceiling height, cleverly reflecting the custom-designed chandeliers elegantly suspended through the airy double height volume. 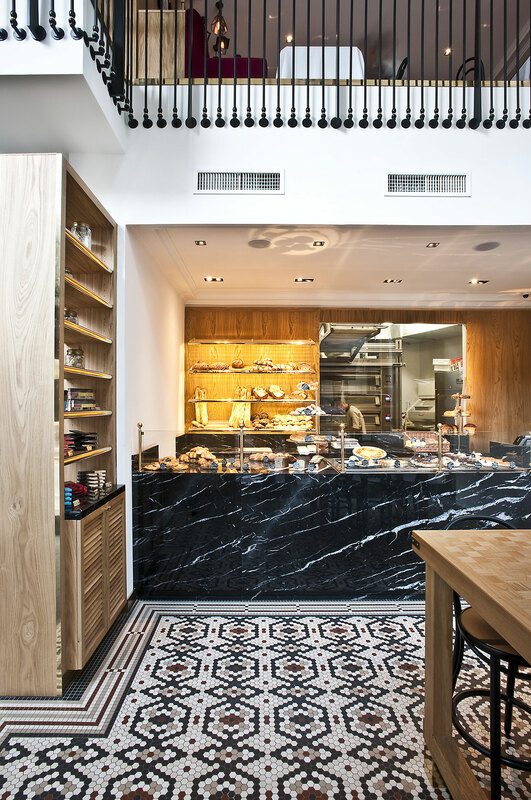 A bold black marble bakery counter provides a beautiful backdrop to display the deliciously mouth-watering delicacies, baked fresh daily on site, whilst stools surrounding a tall timber bench offer a casual dining setting. 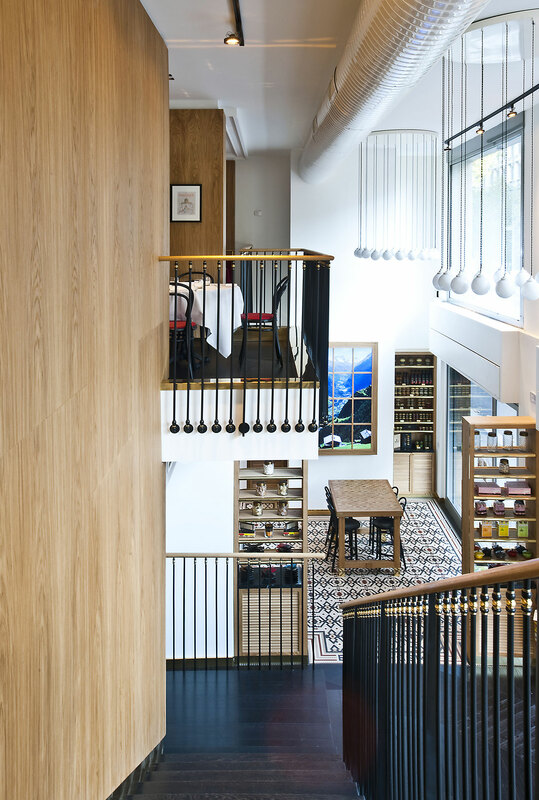 The black timber treads and custom designed iron and brass balustrade of the central staircase leads diners up to the first floor restaurant which is divided into two distinct spaces: the first comprising of a table d’hôte where diners sitting at polished black and brass-detailed tables are enveloped by the rich deep crimson honeycombed wall, with a view to the activity within the kitchen beyond adding a sense of dynamism to the atmosphere; the second, a more classical style of dining complete with timber wall-panelling, a black-stained timber herringbone floor, and velvet upholstered banquettes, coupled with traditional bentwood chairs and tables dressed with white tablecloths. These two sections are separated by a large central service hub, the black marble bench of which continues the design language as seen on the level below.